In 2018, at the request of the United States Environmental Protection Agency and the Association of State Drinking Water Administrators states provided updates on their asset management activities. 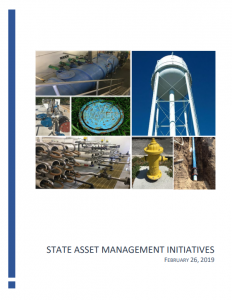 The purpose of this document, State Asset Management Initiatives, is for state agencies to learn about the various initiatives that other states are undertaking involving the promotion of asset management. The categories of initiatives include: funding activities, regulatory activities, assistance activities and internal activities. The matrix on pages one and two provides a snapshot of each state’s activities. The remainder of the document contains descriptions that states provided about the activities. Not all activities marked in the matrix have associated descriptions.